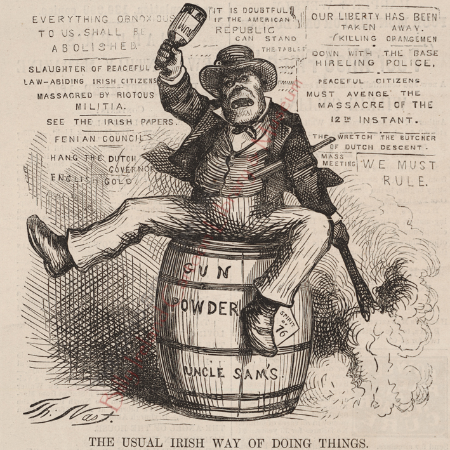 Negative Irish stereotypes depicting the Irish as beasts or apes prevailed in an antebellum Anglo-America and anti-Irish sentiments permeated throughout the lives of ordinary Americans, not just nativists. Historian Dale Knobel, in Paddy and the Republic, examined the culture of language in everyday American life, taking into account the personal correspondence, political speeches, textbooks, travel literature, newspaper, and magazines, songs, theater and novels that were read, discussed and exchanged. Knobel discovered that negative attitudes toward the Irish existed in America and were expressed throughout the course of everyday life and strengthened as the Civil War approached, a period where his research concludes. Considering the Irish in America as “outsiders” rather than “insiders” manifested how Protestant nativists weighed immigrant identity and eligibility as Americans in the early and mid-nineteenth century. Acceptance as potential citizen material depended primarily on race, religion and political character. 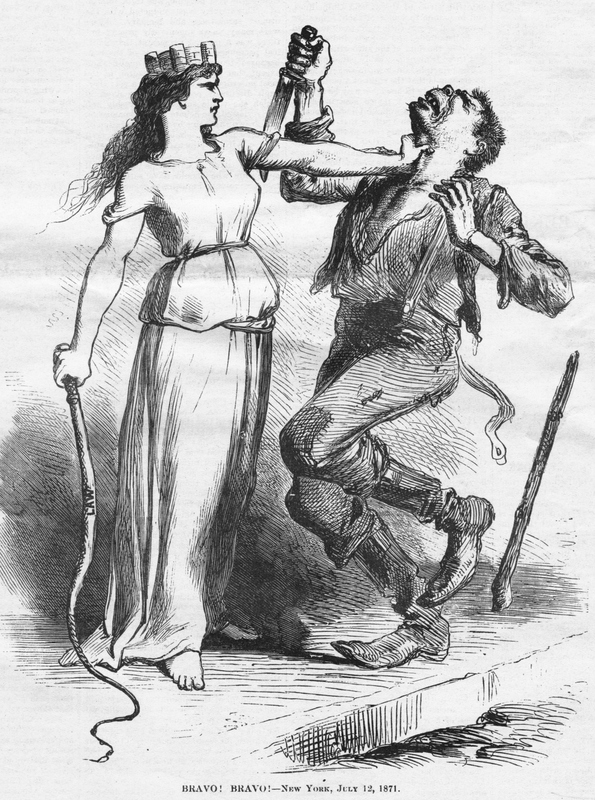 As the Great Famine migrations progressed toward America, attitudes about the Irish coalesced into a stereotype known as “Paddy” and his female equivalent “Bridget” and Knobel argues that their creation “was a collection of adjectives applied over and over again to the Irish in Americans’ ordinary conversation. This is the authentic definition of a stereotype” (11). Long before Thomas Nast came to America in 1846, “Paddy” had been well established and “no mere accumulation of random references” (17). Early Paddy stereotypes drew from perceptions of personal character. Although kinder language did surface in Knobel’s surveys of content material, words like “pugnacious,” “quarrelsome,” “impudent,” “impertinent,” “ignorant,” “wickedness,” “vicious,” and “reckless” accumulate as a frequent part of the American lexicon as it related to Irish Americans. As the nineteenth century turned past its midpoint, Knobel uncovered a marked change in references to physical descriptions of the Irish over describing their character. Descriptors like “ragged,” “lowbrow,” “brutish,” “wild-looking,” and “course-haired” began to surface more frequently. Knobel’s most fascinating revelation was that in everyday situations in antebellum New York, Anglo-Americans had many opportunities to personally encounter the Irish, especially as servants and peddlers. In Protestant conversations with the Irish and with each other, “words propagated an image of the Irish and thus an attitude” and became a source of judgment. Even if they did not have these occasions to meet an Irish in person, certain assumptions were made and believed to be true, because Americans had become accustomed to believing them (15-16). Knobel cautions against the inclination to only blame American nativism for anti-Irish sentiment in mid-nineteenth century America. While Knobel’s primary focus was establishing the locations and frequency of words that formed to shape American attitudes and stereotypes of the Irish, he is correct that these words and the mental images that went along with them were enhanced by visual representation such as stage performances and by cartoons. These portrayals and images helped to establish what antebellum New Yorkers likely thought and considered as fact in forming opinions about the Irish. Thomas Nast came to age in this hegemony and like other artists of his time continued the tradition. Keeping in mind Knobel’s argument, it is nevertheless useful to look into the origins of the stereotype, which originated in Great Britain. The Irish-as-ape-stereotype frequently surfaces, as a popular trope, with the English in the mid-nineteenth century. But, In Nothing But the Same Old Story, researcher Liz Curtis provides plentiful examples that establish anti-Irish sentiment as a centuries-long tradition. Dehumanizing the Irish by drawing them as beasts or primates served as a convenient technique for any conqueror, and it made perfect sense for an English empire intent on placing Ireland and its people under its jurisdiction and control. The English needed to prove the backwardness of the Irish to justify their colonization (16). When the Irish fought back against English oppression, their violence only perpetuated the “violent beast” prejudice held against them. English artist James Gillray had drawn the Irish as an ogre – a type of humanoid beast – in a reaction to the Irish’s short-lived rebellion against England in 1798. Even before English scientific circles had begun to distort Darwin’s On the Origin of the Species later in the century, the English had favored the monkey and ape as a symbol for Hibernians. Belief in emerging eugenics also emboldened a place for white European superiority. New York brothers Orson Squire Fowler and Lorenzo Niles Fowler, pioneers of phrenology, touted a philosophy and pseudo-scientific method that rated human intelligence and placement on an evolutionary scale based on the favorable or unfavorable measurements of one’s head. They opened shop in Manhattan in 1835 measuring or “reading” people’s skulls. 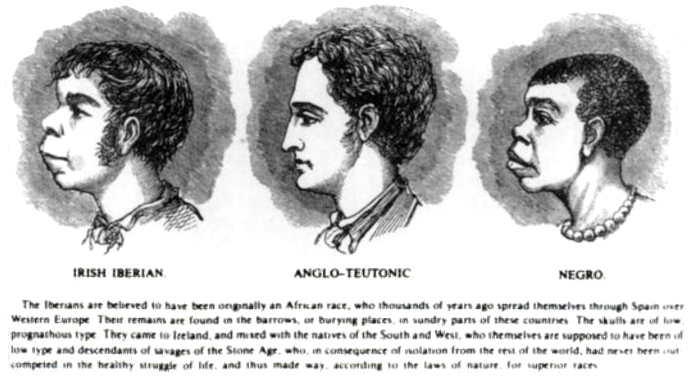 The Fowlers published several books and manuals on scientific methods of identifying, establishing and securing one’s (white people) superior place in society. The size and shape of the skull and forehead were thought to be indicators of “racial-biological differences” (Tchen 148). The Fowlers and their followers believed the assumption that “skulls divergent from the shape of certain northern and western European types were automatically of a lower order” (Tchen 148). Nast too had his cranium measured and examined. “Like so many nineteenth-century Americans, Nast believed that genetic heritage, national characteristics, personal qualities, and achievements all manifested themselves in the physical body” (Halloran 51). No one it seemed, questioned the science of the day. 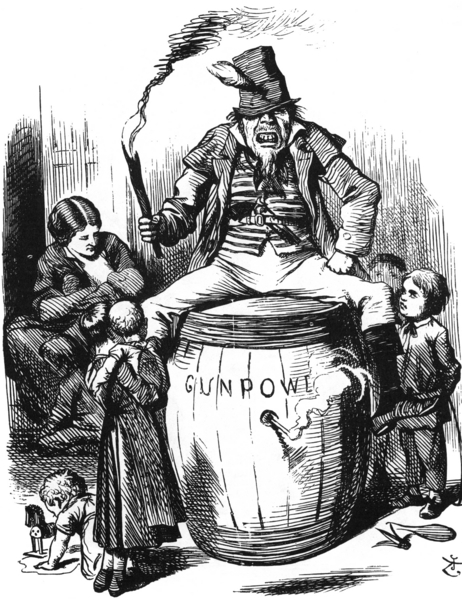 In Punch, a popular English weekly illustrated magazine (1841-2002) anti-Irish cartoons were common. In TheBritish Lion and the Irish Monkey, (April 8, 1848) artist John Leach created a tiny monkey (Ireland) who faces a majestic, regal lion (Great Britain). Why a monkey, and not another animal to serve as the preferred animal symbol? The size of the monkey poses no threat to the regal lion. The monkey would have been familiar to the public as a circus or organ grinder’s companion – a demure creature easily trained and controlled. This monkey wears a court jester’s hat. Clearly, to the British literati and readers of Punch, the Irish are a joke. However, the use of the elfin monkey to depict the Irish is less common than the use of an ape. The ape could be understood as human-like, particularly in terms of Darwin’s new theory of evolution, yet inferior to humans. A beast that could encapsulate rough, unsophisticated behavior conveniently attributed to the Irish. Ape-like features assigned to the Irish soon became the ideal stereotype to emphasize the perceived beastly and violent nature of the Irish. 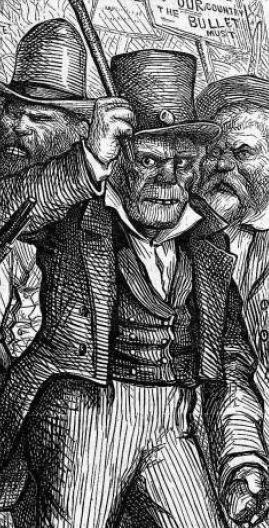 As early as 1842, Punch’s artists “drew on popular notions of physiognomy that the angularity of a face connoted a lower stage of evolutionary development” (Justice 177) and they adopted the practice to depict the Irish consistently in derogatory terms. A Frankenstein monster, seen left, represents Catholic political activism and protests for emancipation, home rule and repeal of the British Union. Under the leadership of charismatic, nationalist Irish leaders like Daniel O’Connell, Ireland’s Catholic peasants were emboldened to demand change. Punch quickly and effectively shut down these aspirations with ridicule. Animalistic dehumanization was only one of many techniques designed to oppress the Irish and deny them full, human consideration. By regarding the Irish as an “other” the English could justify and guiltlessly ignore the repercussions of their oppression and cruelty toward the Irish. Watching the Irish starve during the Great Potato Famine Hunger was one manifestation of this belief system. During the height of the Great Famine, Punch published the English Labourer’s Burden (Feb. 24, 1849) complaining on behalf of England’s outlay of ₤50,000 of famine relief, given to silence Irish protest and demands for assistance. The Irishman is depicted as a gruff simpleton, getting a free ride on the back of an ordinary English laborer. The English government displayed little sympathy or compassion for the Irish or their famine–related predicaments and despair. Numerous objections to the Irish proliferated in America as well. Like the English, American Protestants viewed Irish Catholics as “a separate people” (Heuston 82). Irish-American historian Timothy Meagher agrees. “The new Irish American was Catholic. Irish Protestants began melting away into the broader Protestant mainstream” making an effort to vehemently distinguish themselves from the Catholic Irish and preferring to define themselves as Scotch-Irish. See Orangeman’s Riots. “Most Protestants in America by this time had abandoned the definition of “Irishmen” in order to distance themselves from the Irish Catholic (295). The feeling was mutual. Irish Catholics saw themselves differently from Protestants and, as an embattled people, “in competition with and fighting against all Protestants, Irish or otherwise.” In New York, politician William M. “Boss Tweed” seeking votes, helped the Irish Catholics gain legitimacy and this alliance of Irish Catholics, Tweed and Democratic politics propelled Nast to attack. Nast was also deeply influenced by the cartoons of English artist John Tenniel who drew for Punch. Tenniel enjoyed star status as Punch’s lead illustrator for several decades. Tenniel also received high praise for his illustrations of Lewis Carroll’s Alice in Wonderland. He was later knighted and enjoyed a privileged life in England. John Tenniel drew this Guy Fawkes for Punch on 28 December 1867. Tenniel was a major influence on Nast when the latter moved into a caricature for Harper’s Weekly. 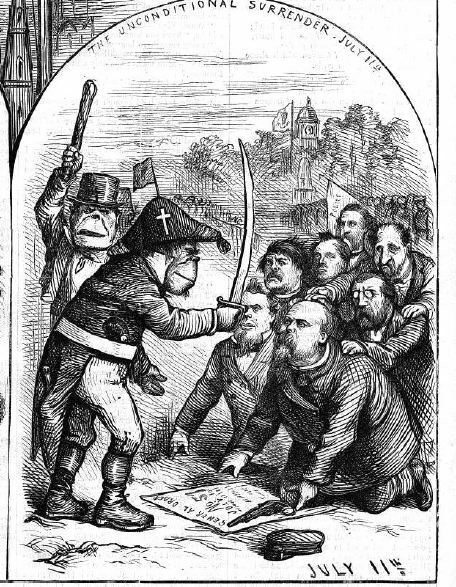 Nast heavily borrowed from Tenniel’s 1867 cartoon to create his version of an Irish-Catholic scandal.Nast charged hypocrisy when the Catholic Irish rioted to protest Protestant Irish’s right to parade in New York City. Whether once sees this cartoon as effective or as offensive, Nast’s visual attack could hardly be called “original.”The Usual Way of Doing Things, by Thomas Nast, 1871. Source: The Ohio State University. 4.) Irish-Democrats pro-labor violence against Chinese immigrants. Whether Nast was justified in his decision to attack Irish-Catholics is complicated and modern sensibilities judge Nast harshly. For these reasons, he remains the subject of passionate debate. Nast drew positive images of the Irish, but these representations often blend into the background. Modern lobbying efforts to keep Nast out of the New Jersey Hall of Fame have so far been successful. Nast was tolerant of all races, nationalities, and creeds. He was not, however, tolerant of ignorance. He deplored the mob mentality that in his mind, the Irish represented. Their alliance with Tweed and Democratic Party values drove Nast to draw with savage fervor. It wasn’t the Irish per se, but what the Irish did with their political power and alliances that Nast found disturbing. As Patricia Hills points out, “he [Nast] castigates only the ignorant and bigoted who engage in reprehensible deeds” (115). The working-men of this State know perfectly well that no such danger exists as that which is hinted at in Mr. Tweed’s bill. The Chinese invasion, of which he seems to be so much afraid is altogether mythical, as everybody in his sober senses is well aware; and Mr. Tweed presumes too much on the ignorance or the prejudices of the working-men if he expects to delude them with such a flimsy cheat. The general sentiment of the American people on this question is admirably expressed in Mr. Nast’s cartoon. A majority in this country still adhere to the old Revolutionary doctrine that all men are free and equal before the law, and possess inalienable rights which even Mr. Tweed is bound to respect. Nast featured an imaginary local brouhaha in his cartoon The Chinese Question. Nast places an angry, defiant Columbia front and center to confront the Workingmen menace and she serves as a reminder of America’s values. She stands over a crouched and defeated Chinese man. In addition, Nast utilizes what would become a favorite technique — to plaster current controversy on a wall of public protest. On the wall, all the various forms of hate speech spouted against the Chinese could be read and considered. Chinese are in kind referred to as “coolies” “slaves,” “paupers” and “rat eaters.” Rat eaters, in particular, became a favorite and virulent Chinese stereotype deployed to great effect, especially on the West Coast, in order to dehumanize the Chinese and affirm their “otherness.” “Barbarians” and “heathens” are additional descriptive terms prominently displayed. The placards pronounce the Chinese as the “lowest and vilest of human race,” “vicious and immoral” declares another. Nast’s wall is an effective tool. It collects the hate speech used within the local white labor community. Each layer of verbal expression collects and builds like pounds in a pressure cooker. Workingmen would stop at no insult to rid themselves of the Chinese menace. The Chinese must go. “Their importation must be stopped.” Nast plastered the prejudice for all to see their ugly truth and consider the lie. Nast created a clear visual divide on the issue. The hard edge on the right separates Columbia and the Chinese man from the trouble that is arriving from the other side. Columbia’s body stands in the path as a violent mob approaches. The vertical division creates a tension and theatrical suspense against what comes next and who might prevail. Whipped up by the Tammany frenzy is New York’s version of the Workingmen’s Party. Led by Nast’s quintessential brawny Irish leader, they angrily turn the corner toward Columbia and the Chinese man. Nast dresses his thugs as would-be gentlemen – his Irish brute wears a waistcoat and top hat. The high fashion does not change his savage character or propensity for violence. Nast reprises New York Draft Riot imagery of 1863 to recreate a scene in 1871 and give it additional implications. Nast had provided eye-witness drawings of the New York City draft riots and had not overly implicated the Irish in the violence. By including 1863 draft riot imagery to this event, Nast links Irish involvement with racial violence. In the background lies the evidence of their most notorious mob activity–the lynching and destruction of a “colored” community. The Orangemen’s Riots followed later that summer on July 11-12, 1871 and Nast would once again deploy the same lynching imagery against the Irish. During the same riot, a colored orphanage burned to the ground. By including a smoldering orphan asylum in the background, Nast indicates this mob and associating the participants to the crime. A barren tree is seen in the distance. An empty hangman’s noose dangles from a leafless tree. Below makeshift tombstones acknowledge buried rights, blood, and strikes. With the African American issue handled and put in their rightful place, graves, the Irish-led mob turns to provide their answer to the Chinese question. One problem down, one more problem to go. Nast’s audience understood the significance of Columbia’s inclusion. She appears in Nast cartoons with great effect and is a formidable challenger to thwart Tweed. Having fought and won many battles, she alone has the wherewithal to protect an emotionally defeated Chinese man. Slumped against a wall, framed by “heathen,” “idolater,” and exclamations of paganism, he is confused and helpless against this onslaught of white terror and oppression. He raises one knee to support a clutched hand and lowered head. His eyes are closed and his expression is one of utter despair. Columbia’s long tresses toss as she turns her head, alerted to the approaching mob. Her tiara is marked “U.S.” Her right hand gently touches the head of the crouched Chinese man. Columbia’s left hand rises above her waist and over her heart into a fist. Her neckline bears a shield of America’s stars and stripes. Her expression is resolute. She will not stand for what is about to go down. She addresses the mob, “Hands off, gentlemen! America means fair play for all men.” Columbia is Nast’s voice. Columbia defended the downtrodden before. 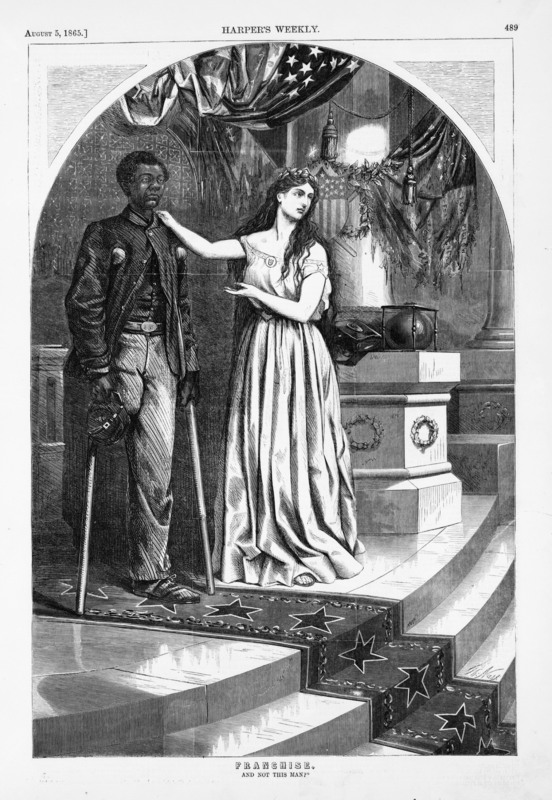 Consider how Nast uses her for “And Not This Man?” on August 5, 1865. Here, as in the Chinese Question, Columbia advocates for civil rights, this time for a wounded African American Civil War veteran. Although seriously wounded, he stands erect. He possesses a quiet dignity. Columbia touches him at the shoulder and invites him to step up for consideration as an American. She is speaking to his legislative detractors who appear on an accompanying page. In Nast’s Chinese Question, Columbia touches the head of the Chinese man. Although he Is able-bodied, he cannot stand on his two legs, he is unable to face his accusers as a whole man, even with Columbia by his side. Nast has intentionally weakened the Chinese man in the face of the mob. The question is why. Is it to evoke empathy for the Chinese man, is it to make the mob look worse than what they were? Could Nast have drawn the Chinese with more dignity? The Irish were afraid of labor competition. Struggling to get established in America the Irish organized in their new home and resolved that they would not suffer the oppression they experienced in their homeland of Ireland. As Timothy Meagher has noted, the Irish had no history of prejudice or exhibited any racist behavior in Ireland. They possessed, Meagher suggests, all of the sensitivities necessary to be empathetic to others who were oppressed. But in nineteenth-century Ireland, the Irish had learned that organization and activism produced results, albeit limited. The new Irish immigrant in America faced hurdles other immigrants, such as the Germans did not. Because of the Great Famine, they arrived in very large numbers and in the most destitute of conditions. As Roman Catholics, they were considered by the Protestant population as members of a strange cult, unwilling to assimilate to American culture. These built-in prejudices, Meagher argues, forced the Irish to assert their “whiteness” and be demonstratively aggressive to other races, in particular, African Americans and Chinese Americans. Meagher cites the work of Moses Rischin who observed that Irish Catholics who aligned against the Chinese in California, and Irish Catholics who aligned with Democratic anti-abolitionists in the South, found greater acceptance into the white Protestant mainstream of their respective communities if they joined others who expressed racial paranoia. The prevailing view of many historians asserts that the Irish feared any form of labor competition. The banding together of white against black would not work to the Irish’s favor in the Northeast, and Meagher offers several opinions that dispute a view that the Irish were afraid of southern blacks seeking northern jobs. Meagher warns against drawing such simplistic conclusions that point strictly at racial tensions or only that only targeted African Americans. The Irish were hostile to all competitors including other ethnicities. They fought with Germans and Chinese. Real fear existed that a “powerful Republican Party and rich industrialists, would overpower the Irish” (223). Meagher notes that the New York Times was exasperated with the Irish, writing in 1880, “the hospitable and generous Irishman has almost no friendship for any race but his own. As laborer and politician, he detests the Italian. Between him and the German-American citizen, there is a great gulf fixed…but the most naturalized thing for the Americanized Irishman is to drive out all other foreigners, whatever may be their religious tenets” (223). Observations such as these, Meagher suggests, establish that tensions went beyond Irish-African-American tension and violence. The Chinese were easy targets. As victims of the English oppression and prejudice in their homeland, and again in America, as targets of nativist and Protestant fears in America, the Irish directed their paranoia, distrust toward non-Irish and non-Catholics. Irish Americans battled persistent and ill-informed scientific theory which classified them as a unique and inferior human race. The Irish were not considered white. For Irish-Americans, defining others as inferior was an early step in self-preservation. As other ethnicities began to fear the Chinese, many Irish not only latched on to this common concern but took the lead in ridding the nation of the menace. By attacking the Chinese, the Irish could prove their “whiteness” and earn a legitimate place in American society. Once severely oppressed in Ireland, and again in America, many Irish turned the tables by becoming the oppressors. Nast would never let the Irish forget this irony. 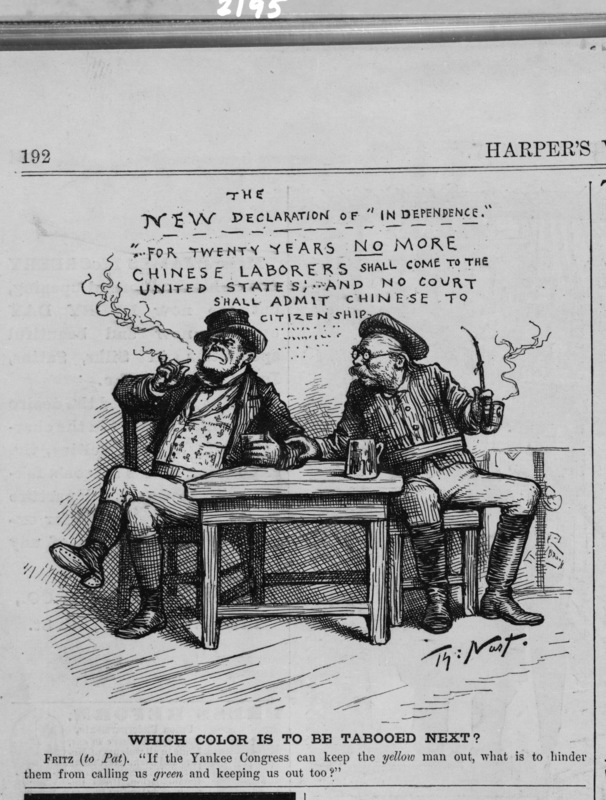 Thomas Nast applies irony and a direct hit at hypocrisy to this 1882 commentary drawn on the eve of the passage of the Chinese Exclusion Act. 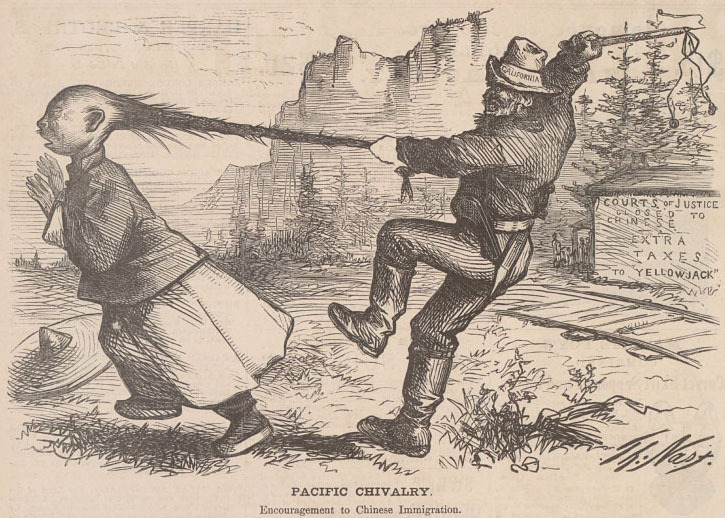 “Uncivilized” and “barbaric” were leading accusations (two of many) hurled against the Chinese by American citizens and other immigrant groups in America. Always defined and depicted as outsiders, sojourners and as “others,” the Chinese were not accorded the rights of other immigrants. In many locations, especially in the West, the Chinese were specifically prohibited to integrate or assimilate into what was viewed as normal white American culture. Nast assumes this voice of normal America and suggests if only the Chinese could be like us, behave like us–if only they could “embrace civilization”–the Euro-American brand of civilization–then maybe they could remain in the United States. Nast throws this tolerated behavior of American civilization right in the face of his critics and illustrates the baseless hypocrisy of their xenophobic anti-Chinese sentiment. Nast’s use of humor is effective. The center image is a direct hit at the Irish, whose penchant for whiskey was an oft-repeated stereotype. Perhaps, if the Chinese could drink like the Irish, then maybe they could stay. Or, how about good old fashioned pugilism? For decades, the Irish had earned a reputation for bare-knuckle prizefighting. White men considered Chinese men docile. As boxers, the Irish had organized violence into a popular entertainment and sport. Did the public really want to see the Chinese taking up fights? Cheap, competitive labor kept the Chinese busy and productive. If they raised their rates and joined the labor unions they could join the ranks of civilized men and strike, starve, and loaf about the city streets. Many white working Americans viewed the Chinese as a threat because they worked hard, kept to themselves and aided capitalist interests. Nast offers an alternative. He invites the reader to consider the reality and dangers of getting what one asks for. Would pro-labor prefer drunk, idle, unproductive Chinese beggars? Will this behavior help the Chinese advance the way the Irish did? Is this how the Chinese must behave in order to join the ranks of civilized men? Through this collection of visual tales, Nast exposes the irony and the hypocrisy of accusations leveled by white men and the demands they placed upon the Chinese. Are the Irish the standard, the role model for acceptance? By 1882, Nast grew disgusted with U.S. Senator James G. Blaine Republican from Maine who sided against the Chinese in the debate for Exclusion legislation. The image of a Chinese man as a U.S. Senator, doing nothing but “talk,” “talk,” “talk” is a stab at the hypocrisy and ineffectiveness of public service and the current state of political integrity as Nast saw it. In October 2011, Thomas Nast, (1840-1902) appeared among a list of distinguished individuals nominated again for induction into The New Jersey Hall of Fame. The nomination, Nast’s third in four years, would not result in his induction. Despite Nast’s legacy as the “Father of the American Caricature” (Harper’s Weekly, Dec. 20, 1902), the accolades and fame earned for his series of approximately 50 cartoons exposing the corrupt New York City Tammany Hall boss William Meager Tweed would not be enough. Rather, it would be another Nast legacy, his anti-Irish and anti-Catholic cartoons drawn primarily in the late-1860s to mid-1870s, which determined Nast’s failure to be included in the Hall of Fame roster. Caricature can be a cruel expression of contempt. Cartoon historians Stephen Hess and Milton Kaplan refer to caricature as the Ungentlemanly Art; Donald Dewey, the Art of Ill Will. As an editorial caricaturist, Nast relied on techniques to exaggerate physical features, employ personal ridicule, symbolism, and stereotype to expose what he saw as “a struggle between good and evil” (Dewey 7). Nast viewed Irish Americans and the Catholic Church in the post-Civil War era as direct threats to the Republican values of inclusion, unity, toleration, and fairness. He saw the rise of Tweed’s Democratic Tammany Hall Ring, the Irish immigrants, and American Roman Catholics as inexorably linked, one group enabling the others’ prominence. Nearly a century and a half after they were drawn, Nast’s Irish and Catholic depictions continue to deeply offend. Reprising an English tradition of depicting the Irish as beasts, most typically as apes, Nast’s Irish was a brutish, violent- loving, jaw-jutting aggressor. Nast, who was born and baptized in the Catholic faith, and received early Catholic education, frequently drew sinister-looking Catholic clergy, usually elaborately robed and surrounded by riches. Recently, these images have resurfaced as a retort to Nast’s 2011 Hall of Fame nomination. The cartoons appear in numerous blogs and editorials – examples offered to prove that Thomas Nast was a racist and a bigot. These images should not be viewed in isolation, without historical context to explain their purpose. Thomas Nast had a well-established history of supporting fairness and equity, but he would quickly attack those he had previously championed when he perceived hypocrisy, corruption or stupidity within the ranks of previous favorites. Nast’s most famous targets: Tweed and the Irish-Americans Catholics who affiliated with and benefited from the political boss, had questionable alliances and political stances. As emerging actors in New York City Democratic politics, Irish-American Catholics under Tweed’s protection provided a critical backdrop in which a six-year-old Catholic immigrant from Germany came of age, and formed a political identity. Nast witnessed extraordinary characters and cultures, indeed he was part of New York City’s immigrant identity. As Nast matured in this cultural and political soup, he found a passionate solidarity within the progressive politics of the new Republican Party. In particular, after the Civil War, Nast identified his enemies as Democrats and their positions on key social and political issues fueled the ire in his ink. Nast critics deserve a hearing, however. For example, in his 1863 Emancipation drawing, Nast took great effort to present an optimistic vision of African Americans contrasted against a reminder of African American slavery and oppression. It was important for Nast to present the two together. But when it came to the Irish-American experience, Nast did not explore or comment on the Irish’s long history of oppression in Europe. Nast appears not to have considered any background material which could have furthered his understanding of their collective behavior in America. His work is not sympathetic to the Irish’s dire living conditions in New York City. Nast may have shared a common attitude held by most Germans Americans that they superior to the Irish. If Nast felt superior, he was not alone. Dale Knobel explains that the rank and file Americans, prior to the war at least, believed that environment was a direct result of a defect in character – in this case, the native Irish character, and character developed from one’s environment. The prevailing view among Protestant Americans held that the Irish had made poor life decisions (marrying early, too many children, following a pope and superstitious religion) and therefore deserved their troubled lot in life (82). Irish-American historian Timothy Meagher writes that Ireland’s troubled history is often overlooked when explaining subsequent Irish American behavior. The Irish didn’t act like Germans because “they were from Ireland and had learned “lessons” there that shaped their reaction” to other races religions and cultures (224). Had Nast fully studied and appreciated the Irish’s history of oppression and the extraordinary circumstances that caused them to emigrate to America, would he have excused the intertwined relationship of Irish Catholics with Tweed? Probably not. As sympathetic as he was to African Americans, Nast later resorted to racial caricatures and lampooned African Americans when they (in Nast’s opinion) too easily gave away new civil rights gains in the early days of the Restoration. Nast felt they hurridly compromised with southern Democratic politicians — a ruling class Nast felt to to be insincere and corrupt. Blacks, who Nast once drew with dignity and respect, later became guffawing simpletons who didn’t know better — incapable of navigating through the complex and murky waters of southern politics. As tender as Nast could be in an image like Emancipation, he could be unmerciful in his treatment of minorities in images like The Ignorant Vote. These depictions couldn’t be any more inconsistent. Albert Bigelow Paine, (1861-1937) was Nast’s only contemporary biographer and penned a reverential 600-page tome published two years after Nast’s death. Paine interviewed Nast toward the end of his life, and he does not challenge the recollections of his subject and the anti-Irish and anti-Catholic drawings are weakly examined. In an effort to explain away the anti-Catholic reputation that had obviously lingered and threatened to tarnish Nast’s legacy, Paine wrote, “He was inspired by no antagonism to any church–indeed he was always attracted by Catholic forms and ceremonies” (150). Extraordinary and divisive national events shaped Nast’s persona and outlook. In his adopted country, Nast embraced and championed a Republican political view — a position reinforced by his employers at Harper’s Weekly and the at-large intelligentsia of the day. His attitudes about the Irish were not at all unusual. This was the era when “Irish Need Not Apply” signs proliferated across storefronts and businesses. Knobel’s convincing research makes this very clear. In this atmosphere of an evolving America, Nast transitioned from an illustrator to a caricaturist; the latter’s prime purpose was to expose, within his immediate environment, malfeasance, corruption, lapses in morality, etc. To be successful and effective as a visual commentator and observer, his caricature needed to shock and startle. Caricature provokes and elicits conversation and debate. In using caricature, Nast purposely fired a weapon clearly meant to exaggerate, upset, and call attention to a specific issue or crime. Exaggeration was precisely his point. Nast argued for diversity and illustrated these differences with recognizable symbols his readers would immediately grasp — an artist’s version of shorthand. How would Nast have drawn a positive image of an Irishman? Perhaps he did, and these white, Euro-centric faces simply blend in. How would we recognize a positive Nast Irishman if he did not use stereotype? Wouldn’t the Irish look like any other Anglo-American? When something was wrong, went wrong,, Nast drew out his pen and pencil and fired off an attack. The Irish and Catholic alliance with Tweed and the growth of their political prominence and activism (including adopting a pro-slavery political position) provided the fodder — the examples for Nast to run with his preconceptions. It is impossible to get inside the mind and observe attitude as one might observe conduct. We obtain insight into the world of the other person when we are fully aware of what has come to his attention (qtd. Knobel xv). When one browses the Internet and grabs one of Nast’s drawings do we know the full story? Nast drew more than 2,200 cartoons for Harper’s Weekly (Kennedy) alone. A vast majority of his images focused on the people, groups, and religion of my Irish ancestors. In these pieces, I see a slice of history as it was, not how I wish it would have been! His images are historic and possess intrinsic value. Nast came of age during events, controversies, drama, and a cascade of cultures. In order to assess the layers of meaning, and do it with justice, involves an extraordinary commitment of time and affection for history. To fairly evaluate these documents (and Nast’s images) involves having an open mind and a curious nature willing to explore the many backstories and cultures that shaped individual attitudes and behavior during Nast’s career. Every detail — the meaning behind every symbol, the tradition and origin of each stereotype, and the significance of the words, placards, and captions that accompany his caricatures all play a vital role in understanding these cartoons. Caricature and editorial cartoons go beyond mere illustration. Simple illustration captures the obvious action along with the ingredients that everyone recognizes. Caricature captures an unseen truth — a truth exposed, an opinion perhaps, that many would prefer to brush under the carpet. Caricature peels back the layers of illusion and exposes a starker reality. Had it not been for particular political alliances, which in Nast’s view involved stolen elections, misappropriated public funds, and an enormity of ego and arrogance, there would have been few reasons for Nast to have attacked Irish Catholics. Every line Nast drew, he executed toward achieving or arguing for a Republican political view. One may not agree with Nast’s political thinking, but those who are informed about his life and times find it difficult to question the well of integrity from with which he drew his creative inspiration and the evidence of corruption that swirled all around him compelled him to take action. See Uncle Sam’s Thanksgiving Dinner. Nast took to task the people he saw as villains, and as a result, in the eyes of many, became one himself. Nast did not glamorize the villains and threats of his day. He obliterated them through the exposure of black lines on white paper. As wrong as these perceptions and images might feel today, the truth is, most people felt that way toward the Irish. Because of his ability to visualize the way ordinary Americans felt, Thomas Nast now bears the brunt and identification of owning this attitude lock, stock, and barrel. Today, Americans with an Irish heritage often react with anger at Nast’s nomination, and may not fully understand nor be willing to accept the knowledge that a sizable portion of our ancestors, horribly oppressed in Ireland, became oppressors in America. Ignorance is bliss. In the Irish-American struggle to fit into mainstream America, other immigrant groups were mistreated, most notably the Chinese, by the Irish and other white groups. In climbing the rung and elevating one’s status from a low life meant another group had to occupy the lower tier. Horrible things were done to the Chinese in caricature and more importantly, in everyday life. 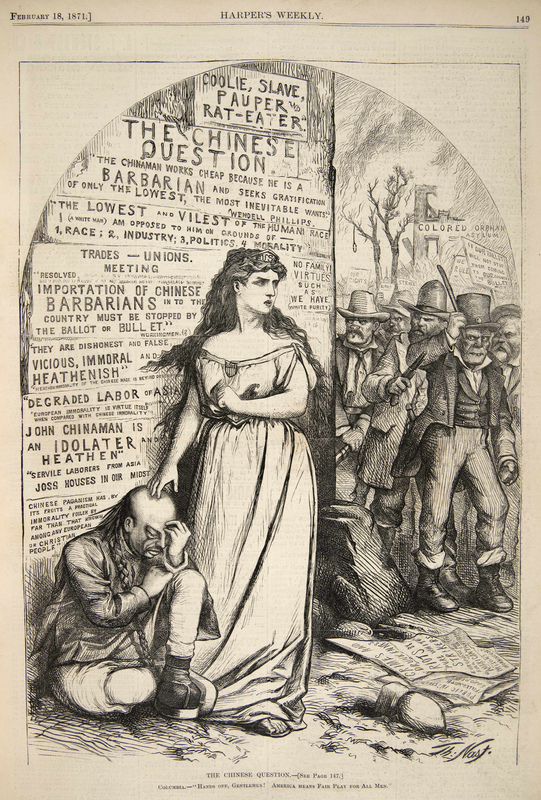 In a large part of organized Irish activism, the Chinese faced a battery of restrictive legislation and were officially excluded from immigrating to America with the Chinese Exclusion Act of 1882. Historical figures like Nast should not be kept out of museums or halls of fame any more than Mark Twain’s use of the N-word should be erased from modern editions of Huckleberry Finn. Our history is full of unique people who did not all get along. The beginning of the immigration era of American history is complicated, extraordinary and often cruel. Nast deserves to be in New Jersey’s Hall of Fame because he earned a place in history through his exposure of political corruption and for documenting the Civil War, national elections, minority struggles and visually capturing and recording northeastern Republican attitudes of a still young nation seeking to reconcile after the Civil War. His art shaped ideas. Not all of us are going to like what he did, and that is fair, but we can’t pretend it didn’t happen. 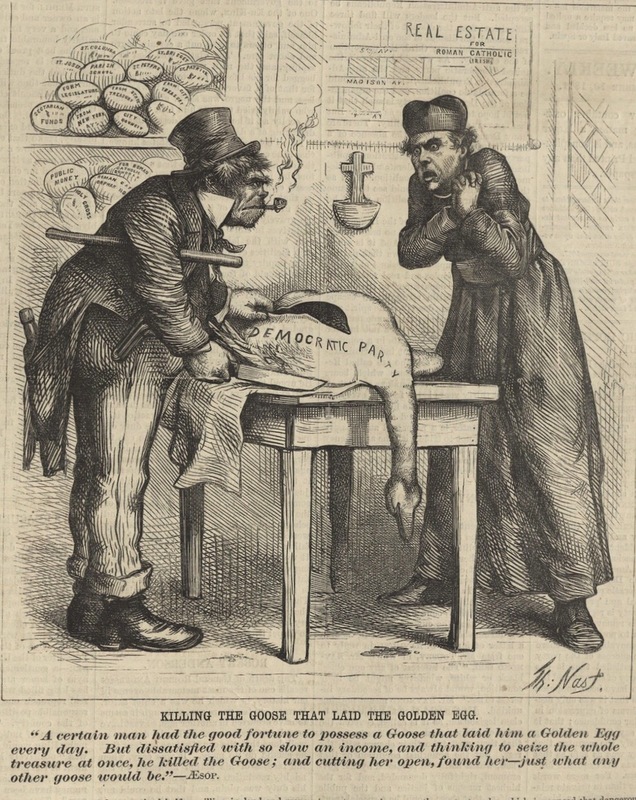 Today, Thomas Nast’s controversial images are an important educational tool for explaining how and why images matter, how stereotypes are developed, used or misused. Caricature is not illustration and it is not meant to be viewed as such. It is sarcasm, it is an over-the-top exaggeration. Its very nature is controversial and Nast executed that art form as few others could, and for that reason alone, regardless of content, he deserves a spot in New Jersey’s Hall of Fame. Fritz, a German and Pat, an Irishman, discuss what race should be tabooed next. The Germans and Irish were often adversarial rivals for jobs, but by the late 1870s and 1880s were more unified as white men as the “Chinese Question” hovered over their economic future. Increasingly Euro-centric whites affiliated with groups like the Workingmen’s Party, whose goal to drive out all labor competition, particularly from the Chinese Chinese were often viewed incorrectly, as “coolies” workers who were brought to the United States under duress, or tricked into contract labor. As these men ponder their victory, they also dwell upon the repercussions of their victory over the Chinese and the passage of the 1882 Chinese Exclusion Act, which had in place, a 20-year option to renew. Nast’s square jawed Irishman in top hat and vest had more to worry about than the German. The Irish had long been considered by other white people as not fully white – a separate race of people who sat on the evolutionary scale above the African American, but below Caucasians. 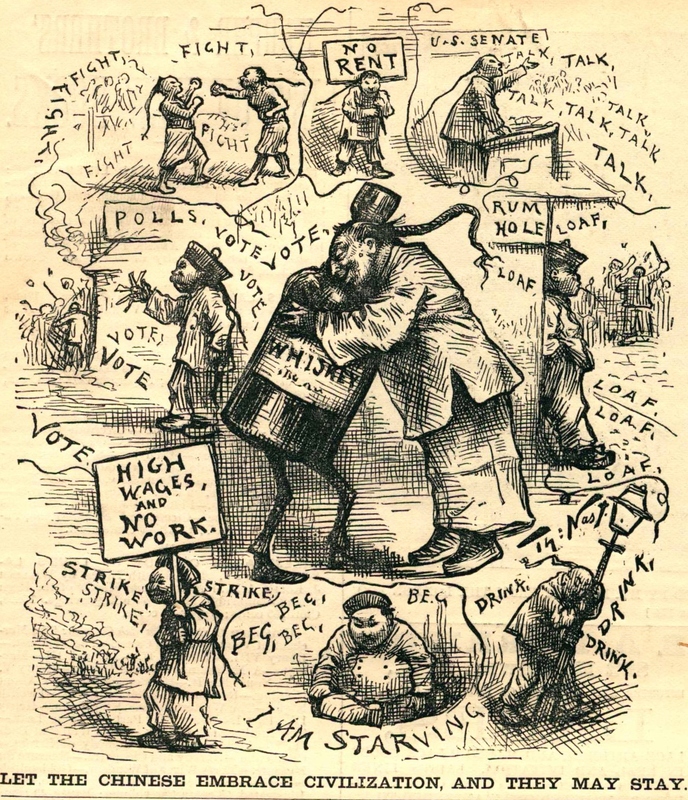 By 1882, the Irish American had made great political gains, but this cartoon infers a certain irony, that people hadn’t completely forgotten earlier perceptions. Seventeen years later, Harper’s Weekly published this scientific-based cartoon. Harper’s Weekly, 1899. Artist Unknown, Misusing Darwin’s science theories as a basis, the idea of the Irish as less than fully white persisted. This cartoon showing the notion that the Irish were physically and scientifically different still persisted 17 years after Nast published his cartoon in 1882. Fritz the German (smoking a Meerschaum styled pipe and holding a mug of German beer) has a good inkling of who might be next in the pecking order. He directs his question and emphasizes it with a slight touch to the Irishman’s arm. We can see the Irishman is considering the implications. A common Nast technique placed proclamations on walls behind his subjects, in this case language direct from the Exclusion Act, on the wall behind the two men as they reflect their future in America. A looming possibility hovers over their casual moment and invades their enjoyment of a legislative victory against the Chinese in America.